[mantra-multi][mantra-column width=”3/4″]Deep in the mountains of Transylvania, there lives the last representative of a dying breed, Felis catus vampirus, also known as the…Vampuss! When young tomcat Jonathan Harker calls upon the reclusive Count Scratchula, he’s led to believe it’s just another business deal. Little does he realize that the course of his nine lives will be forever altered. 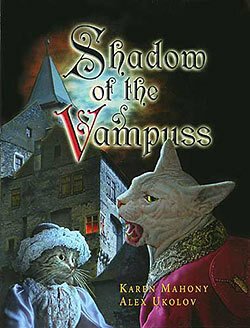 Based on Bram Stokers horror classic, Shadow of the Vampuss is a dazzlingly-illustrated Gothic adventure that’s both beautiful and bizarre.